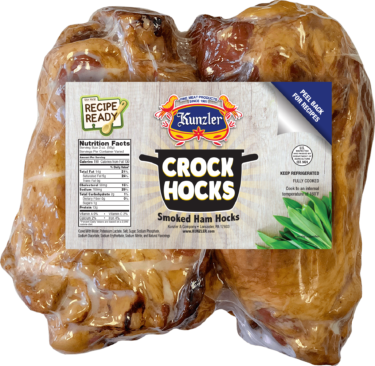 At Kunzler, we are always cooking up new ways to deliver the very best, high quality meats to your family. 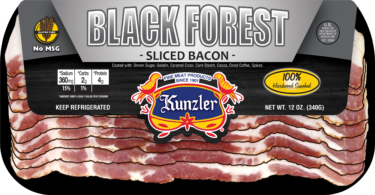 Thick sliced bacon tumbled with sweet black forest spices for a unique taste. Gluten Free and No MSG. Cured with: Water, Salt, Sugar, Sodium Phosphates, Sodium Erythorbate, Natural Flavorings, Sodium Nitrite. Coated With: Brown Sugar, Gelatin, Caramel Color, Corn Starch, Cocoa, Dried Coffee, Spices. This product contains no common allergens. These smoked ham hocks are the perfect solution for a set it and forget it meal. Designed with your slow cooker in mind, you can come home to the fresh aroma of a meal you slaved all day to make! Cured with: Water, Potassium Lactate, Salt, Sugar, Sodium Phosphate, Sodium Diacetate, Sodium Erythorbate, Sodium Nitrite and Natural Flavorings. 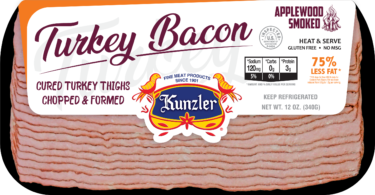 If pork isn’t your thing, we’ve taken the same great taste of Kunzler and created Turkey Bacon! We smoke our turkey bacon with sweet applewood chips for a flavor that you won’t believe has 75% less fat than regular bacon. 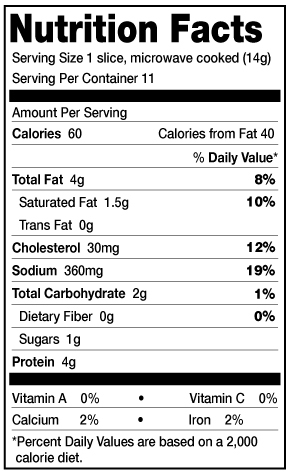 Cured with: Water, 2% or less of: Salt, Sugar, Sodium Phosphates, Sodium Erythorbate, Natural Flavorings, Sodium Nitrite. 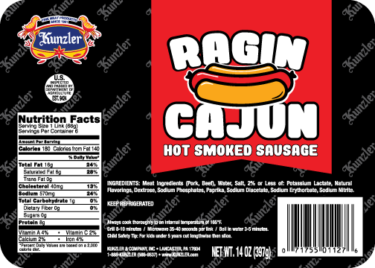 Kunzler’s Ragin Cajun Style Hot Smoked Sausage is made with pork and beef and seasoned with a blend of cayenne and cracked red peppers. This item is known for its spirited bite (this product is quite spicy). Our Ragin Cajun Style Hot Smoked Sausage is smoked while being cooked to give it a savory smoked flavor. 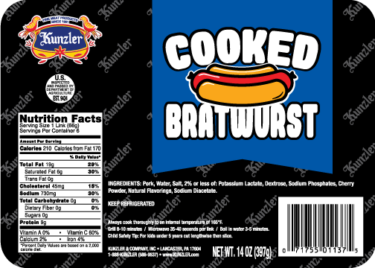 Made with the highest grade of pork and proprietary blend of seasonings our precooked bratwurst is crafted for optimal performance on the grill. This brat is sure to make the neighbors envious of your dinner plans. 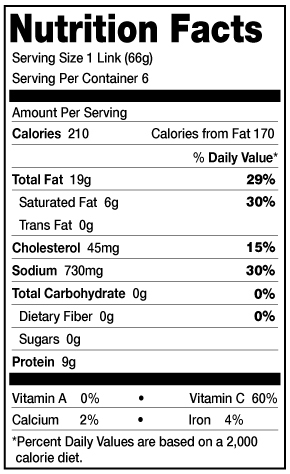 Pork, Water, Salt, 2% or less of: Potassium Lactate, Dextrose, Sodium Phosphates, Cherry Powder, Natural Flavorings, Sodium Diacetate. 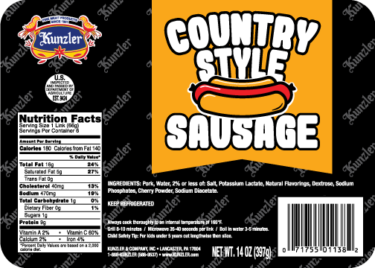 Kunzler’s Country Style Sausage gives you that classic morning flavor you know and love. This sausage is made with coarse ground pork and mildly seasoned with sage, black pepper and red pepper flakes to give it a zesty flavor. Pork, Water, 2% or less of: Salt, Potassium Lactate, Natural Flavorings, Dextrose, Sodium Phosphates, Cherry Powder, Sodium Diacetate.